Toric contact lenses correct astigmatism - a visual defect normally caused by curvature to the cornea or eye lens. Contact Life Toric is the toric version of the new biocompatible monthly lens range, Contact Life by Wöhlk. This lens offers the same fantastic design qualities as its spherical brother. The biocompatible material vitafilcon A is a revolutionary step in the contact lens market. Biocompatible materials are extremely well tolerated by the human body thanks to their similarity to naturally-occurring substances in the body. As a result, irritation and immune reactions are effectively minimised. The material of Contact Life Toric monthly lenses enables high oxygen permeability and retention of moisture. So your eyes are able to breathe, without losing their natural moisture. In comparison tests with similar lenses from other manufacturers, Contact Life has achieved considerably longer durations of wearing - without loss in comfort. The rim of Contact Life Toric lenses are contoured perfectly for the cornea, enabling stable positioning on your eye the whole day long. The result is a unique level of comfort, and superior protection from dryness and physical strains. A powerful UV filter provides further protection, reducing the risk of eye disease later in life. The manufacturer Wöhlk offers a guarantee on the tolerability Contact Life Toric lenses. See what you can save when you order multi-packs of Contact Life Toric contact lenses and bundle offers in the Mister Spex online store. 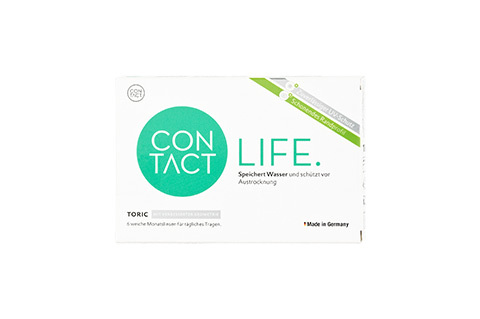 Mister Spex advises all online purchasers of Contact Life Toric contact lenses: the contact lenses, Contact Life Toric, should always be fitted to your eyes by an eye doctor or optician. Unless expressly advised otherwise, you should visit your eye doctor or optician at least once every 6 months. You should have your eyes checked regularly. You should always adhere to the length of time that Wöhlk/your eye doctor/optician's recommend. The wearing time for Contact Life Toric contact lenses should be followed strictly. If you experience eye irritation or visual impairment when wearing Contact Life Toric contact lenses, remove the contact lenses immediately and consult an eye doctor or optician. Damaged contact lenses should be replaced immediately. Failure to comply with these safety precautions can cause permanent damage to your eyes and vision.